A new paper from Erik Wright and Kalin Vetsigian of the Systems Biology theme is pushing scientists studying living communities to consider more than just “survival of the fittest”. The paper, published in Nature Communications on April 21, 2016, suggests that it is important to take into account the history of microbial communities when trying to predict outcomes. In particular, Wright and Vetsigian found that the relative abundance of a given species is a good predictor of that species’ success. In other words, there is evidence that “survival of the common” can rule a community. In extensive head-to-head tournaments, 18 strains of a single genus of bacteria taken from soil samples were paired up and placed into shared environments with unequal starting abundances. Each strain took on each other strain twice: once as the “home team” (starting in high abundance) and once as the “visiting team” (starting in low abundance). 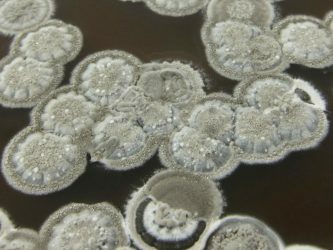 As the bacteria grew, the researchers tracked the abundances in each matchup to see whether the high-abundance strain would hold its ground or the low-abundance strain would manage to invade. 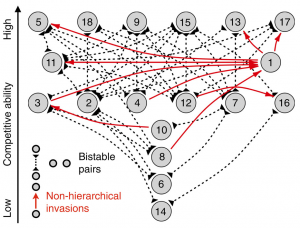 What they found was widespread bistability in pairwise invasions, meaning that in many of the pairings, the home team won while the visitors perished. From the point of view of survival of the fittest, this is unexpected; if fitness is all that matters, home field advantage should not be as important. But rather, survival of the common suggests that the history and order of assembly of a community can be critical for determining its eventual composition. Instead of a single winner best adapted to the environment, the resulting network of relationships between strains features multiple winners at the top of the competitive hierarchy. Additionally, inhibition, whereby some strains produce antibiotics or other compounds to curb the growth of competitors, contributes to bistability. In general, abundant strains benefit from inhibiting possible invaders, while low-abundance strains cannot produce enough toxins to increase their chances of invading. In fact, low-abundance strains that waste energy producing antibiotics (instead of capitalizing on available resources) may fare worse than those that do not attempt to inhibit their abundant neighbors on their home turf. While antibiotic inhibition opposes coexistence of pairs of strains, the resulting bistabilities can in fact contribute to coexistence in complex microbial communities in which both antibiotic production and degradation are important. Wright and Vetsigian expect that survival of the common will generalize to other systems and be a powerful explanatory tool for the development and mechanics of ecosystems and communities. Read the full paper in the April 2016 issue of Nature Communications.